Gateways « Global Market Insights, Inc.
U.S. has been at the forefront of innovations and is one of the key nations attempting to promote and develop smart cities. The country already has a vast network of hotspots at transport facilities, hospitals, restaurants and cafes, as well as at schools and residential buildings, proving to be a significant Wi-Fi hotspot industry hub. Europe, consisting of many developed nations, has also witnessed a tremendous growth in the use of Wi-Fi hotspots and is looking to propagate its services like eGovernance, eTourism and eHealth by giving seamless internet services. Recently, the European Union (EU) secured funds for launching free Wi-Fi hotspots at public places and will allocate EUR 120 million (around USD 136.96 million) to local governments across Europe over the coming three years. Providing a major propulsion to the Wi-Fi hotspot industry, EU has called for applications from local authorities and will grand vouchers to about 2,800 municipalities for installing public hotspots. Even India, which is one of the fastest growing technology consumers in the world, is embracing the notion of offering easy access to the internet. In October this year the Bharat Wi-Fi project was announced which would involve installing nearly 1 million hotspots in the country by the end of 2019. Other developing nations can also be expected to pursue similar strategies to bolster their technology infrastructure and access to information, proliferating the Wi-Fi hotspot market. Elaborating further on the massive opportunities existing for the Wi-Fi hotspot market, Dunkin Donuts has over 9,100 cafes in the U.S. and has recently expressed its intentions to add nearly 1,000 new locations in the country. Dunkin Donuts customers utilize the internet services for browsing, using social networks, gaming and watching videos, all the while consuming their favorite donuts and coffee. The incredible size of the coffee market is demonstrated by the fact that almost 63% Americans drink coffee every day and a considerable number of this population consumes products from cafes. It must be noted that most of the cafes belonging to global brands or local players offer other food items as well, such as sandwiches, pizzas and bakery items, invariably creating a wide range of customer base. 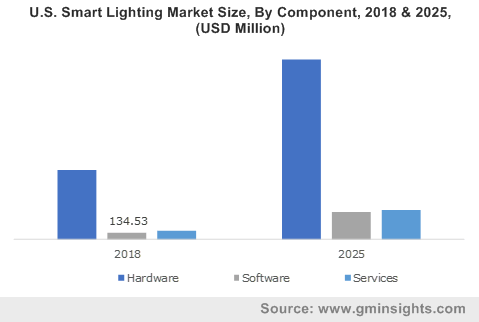 With increasing population, rising consumer spending and growing affordability of required hardware, the café segment will experience a notable rate of Wi-Fi hotspot implementation. 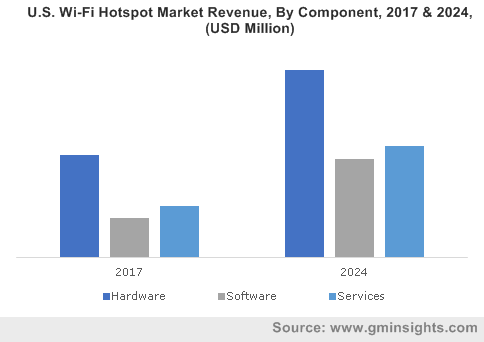 Comprising of key industry participants like Alcatel-Lucent, Aruba Networks, Cisco Systems, Ipass, Motorola Solutions, Nokia Networks and Ericsson, the Wi-Fi hotspot market is anticipated to register more than USD 23 billion in revenue by 2024. This entry was posted in Electronics and Media and tagged Billing Software, Cloud-based Software, Controllers, Gateways, Global Wi-Fi Hotspot Market, Hotspot Management Software, Mobile Hotspot Devices, Security Software, Services, Wi-Fi Hotspot Market, Wi-Fi Hotspot Market Size.